Once the dust settles, the tumbleweeds have passed, the good guys ride off into the sunset, and the baddies are, well, removed from the equation, we could well be assured as to what genre AMC’s new drama series, ‘Hell on Wheels’ falls into. A western? Possibly. A period drama? Perhaps. An intense, ambitious project detailing one of the most action-filled, eventful eras in American history? Most definitely. The series, which debuted on AMC on Sunday, tells the story of the building of the railroads in America, right after the Civil War, and of some of the characters that made the era such an interesting, dangerous, corrupt, unusual and complex one. Veteran Irish actor Colm Meaney (‘The Commitments’, ‘The Damned United’, ‘Layer Cake’), plays railroad magnate Thomas Doc Durant, the man for whom the railroad was not just a dream, but a way for him to become an incredibly wealthy individual, and not always by honest means. Indeed, it is at one point in the series, where Meaney’s character is informed that it be more economical and less time-consuming, for the railroad to be built along an even stretch of land in the Midwest. Durant explains, in an expletive-laden rant, that he is being paid by the mile, and has little interest in such practical measures. Meaney brings his usual intensity, depth and, for this character, cunning and ferocity, to the role, and his character features alongside performances by Anson Mount, who plays a Southern farmer out to track down the Yankee soldiers who raped and murdered his wife, rapper Common, who takes on the role of former slave Elam Ferguson, and young Irish actress, Dominique McElligott, who portrays Lily Bell, a young woman who must face the challenges brought on by the death of her husband. The story begins just as the Civil War has ended, and an eclectic group of schemers and dreamers come together to build the Union Pacific’s transcontinental railroad. The Irish Examiner recently caught up with Colm Meaney, the Dubliner who recently said to New York’s Daily News of his part as Thomas (Doc) Durant: “I love this character. You get to do all the things you can never do in real life”, where he told us a little about ‘Hell on Wheels’. Mike Fitzpatrick (MF): So, how would you describe ‘Hell on Wheels’, is it a western, or more a period drama? 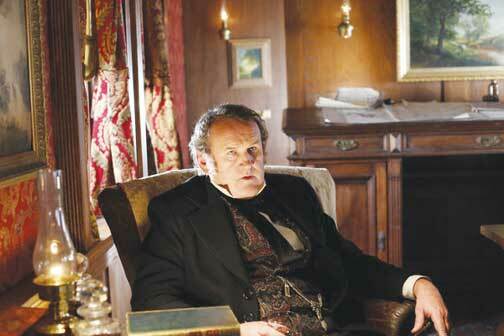 Colm Meaney (CM): A period drama, hmm, I don’t know, I’m not sure if I could describe it as either a period drama or a western, there’s also a lot of humor in it, you know, and because of its great writing, it incorporates (a lot of other genres). MF: With ‘Last of the Mohicans’, ‘Far and Away’ and ‘King of Texas’, you’re no stranger to American, period-style films, is it a genre you particularly enjoy, or is it the roles themselves that capture your interest? CM: The roles definitely yes, (although), I do enjoy historical pieces as well. I recently worked on ‘Bel Ami’ and ‘The Conspirator’, one was set in Paris and one set (in the US). I haven’t done a lot of historical work over the years, but I do enjoy doing it. I’m interested in it, I read a lot of history, and many actors with a theatrical background, do tend towards more historical stuff. MF: You play the role of Thomas ‘Doc’ Durant, who was a real character, was much of the story based upon true events? CM: Yes, absolutely, I mean, it’s well-documented historically, and the writers have stuck to the facts, as it were. I mean, obviously we’ve had to take liberties with certain things, in the course of making a drama. MF: Would you say the role of Durant is anything like somebody you’ve played before? CM: No, it was very different. I was fascinated by the character. He was a very industrious type, a businessman, a wheeler-dealer. His business dealings weren’t always clean! He promotes the railroad, you know, it was his baby, so, he was the driving force behind it. MF: The setting of the movie, during the building of the railroads in the 1860s around the time of the American Civil War, was that a subject you were familiar with previously? CM: Well, the actual building of the railroad, I thought that happened later, I was surprised to discover that it occurred during the time period (in the series), but the Civil War period, I was very familiar with. I did read up a lot on it, from many many years ago, until recently. MF: The cast you’ll be working alongside, are they mostly new to you, or have you worked alongside any of them before? CM: Well, obviously I knew who Common was; Anson I didn’t know, I’d heard his name as a New York theater actor, I didn’t know Ed (Eddie Spears), Dominique (McElligott) I’d not met before. So they were all pretty much new to me! MF: You’ve played a wide variety of roles over the years, from Don Revie the football manager in ‘The Damned United’, Jimmy/Dessie/Larry in the Barrytown trilogy films (‘The Commitments’, ‘The Snapper’ and ‘The Van’, all penned by Irish writer Roddy Doyle), Chief O’Brien in ‘Star Trek’, Gene in ‘Layer Cake’, is there any particular role that you’d enjoy returning to? CM: Well the great thing about the Roddy Doyle parts, was that I did get a chance to return to the role. It was almost a unique opportunity to play the same character, even though he had a different name in each film! It was great to be able to, you know, play more or less the same character, in separate features, it was quite unusual (for me). You know, you’re never really sure that you want to go back to something, or even read for something, it really depends on the script. The reason they never made a second Commitments, was because they never found the right script. MF: You’ve starred in many Irish films over the years, such as ‘Kings’, ‘The Boys from County Clare’, ‘Intermission’ and of course, the Barrytown trilogy, which ones would rank as your own personal favorites? CM: The Van has always been a favorite of mine, of the three (stories from Roddy Doyle’s ‘Barrytown’ trilogy), I think it was the one that got kind of lost, because people really expected something else. They’d seen ‘The Snapper’, which was very much a feel-good movie, then ‘The Commitments’, it was a comedy as well, ‘The Van’, was set in a different tone, about a guy having a mid-life crisis. And for that reason, people weren’t really sure about it. I think it’s a beautifully-made film and I’m very proud of it. Another film I did in Ireland about ten years ago, was ‘How Harry Became A Tree’. It was a film I loved, by a wonderful (filmmaker), Goran Pascaljevic, a Serbian director, who is a bit of a genius I think. Being released around the time of 9/11, though, it kind of got lost in the shuffle there, you know? But, it’s a lovely, lovely film. MF: Growing up in Dublin, were there any particular actors out there that would have influenced your decision to get into the business? CM: I loved Peter O’Toole. I was lucky enough to have caught him on stage a couple of times, when I was very young, and then of course, in films, there were Steve McQeen and Paul Newman, great great actors! ‘Hell on Wheels’, starring Colm Meaney, Dominique McElligott, Anson Mount and Common, is shown on Sunday nights on AMC.